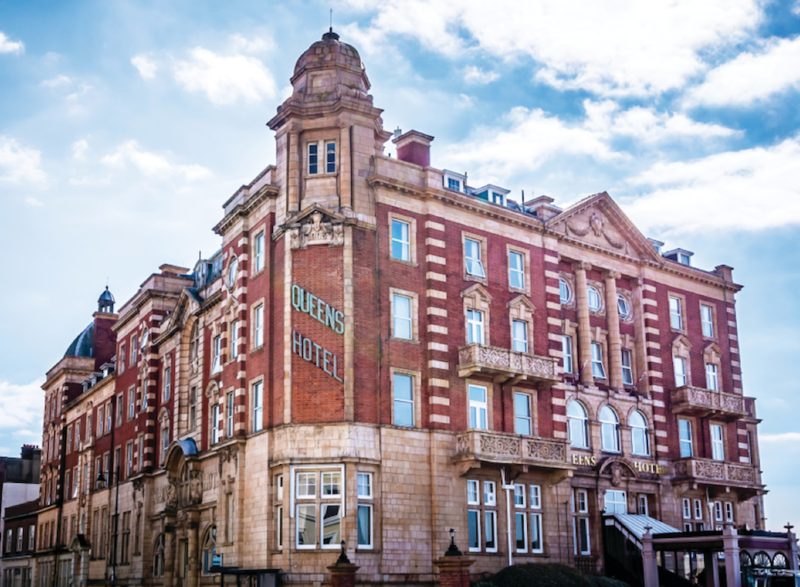 Southsea Lifestyle writer Kate Thompson was delighted to be invited back to see the progress being made in the multi-million-pound transformation of the beautiful Queens Hotel. From the gold leaf adorned ceiling panels to the sumptuous new Axminster carpet, it’s clear to see that no expense has been spared in the opulent Elizabeth Room at the Queens Hotel. Interior designer Rebecca Peach has allowed the scale and elegance of the room to shape her scheme, and it will provide the perfect backdrop for weddings and grand gatherings for many years to come. 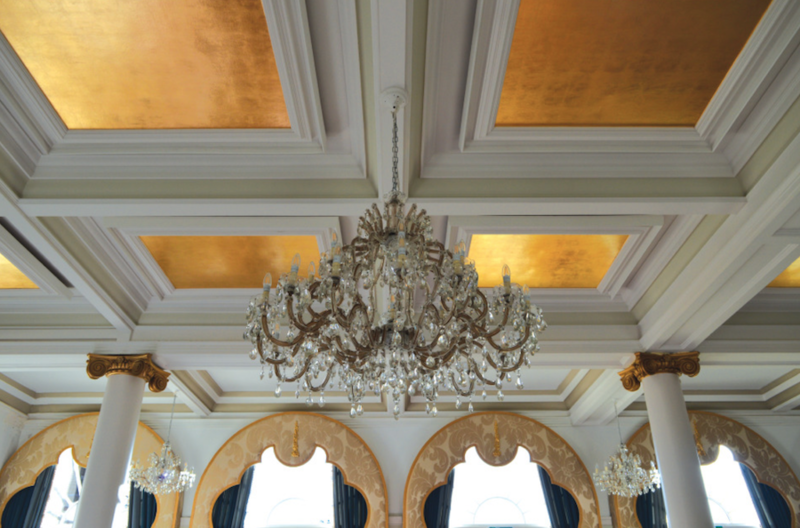 It took four and a half weeks to complete the painstaking application of the gold leaf to the ceiling panels at a cost of £50,000 – a fifth of the overall budget to transform the stunning space. “We’ve set up a joinery workshop in the basement so we can do the more intricate restoration work using skills from years gone by,” explained Farid Yeganeh, the hotelier who leads the consortium of owners. You can always tell a great deal about an establishment by the state of the traditionally smallest room in the place. Female visitors to the Queens Hotel may recall the quite simply enormous ladies’ loos that were spectacularly over specified when it came to floorspace. (The space has now been re-configured to create a suite of offices). 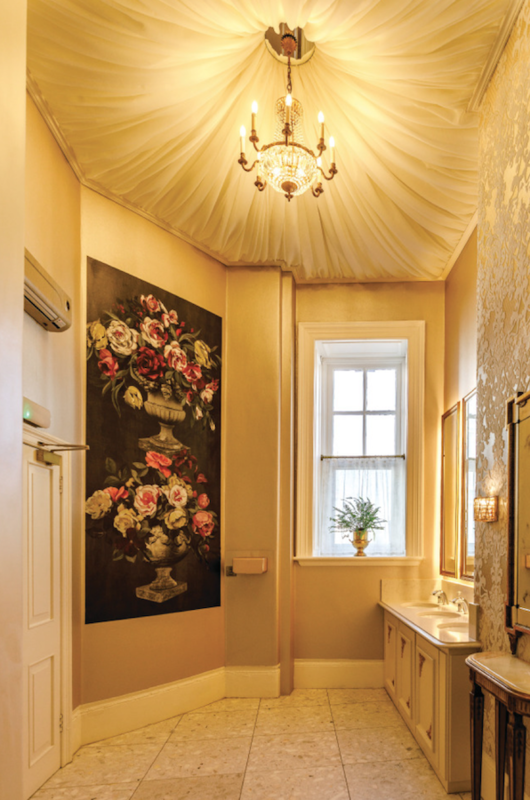 A beautiful new powder room has been built in the former coachman’s residence. It’s the place where, in days gone by, he could keep an eye out for approaching carriages through his strategically placed look-out. Accessed via the original marble stairs, the space is delightful. And fellas can answer the call of nature in suitably stylish surroundings too. Rebecca Peach has waved her magic wand in the bedrooms too, using dramatic colour schemes to make the most of the scale and outlook. They are spacious and luxurious with balconies over-looking the stunning Solent seascape. “We just love that view – it’s changing all the time and we are so lucky to be able to offer the best location to see everything. “We have a live webcam which can be accessed from our website, so everyone can see the Solent and all the wonderful events we have here, such as the Victorious Festival,” said Farid. The team of craftsmen he has secured to undertake the transformation of the Queens Hotel clearly love the challenge of the work. 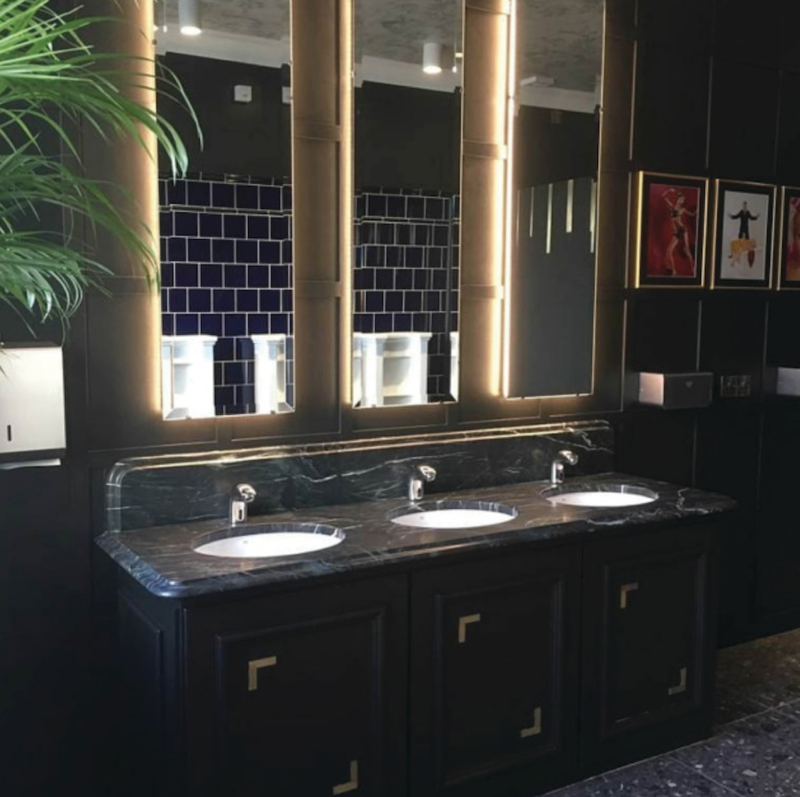 They have come up with neat solutions that amplify the inherent beauty of the Edwardian baroque building, while at the same time bringing it up to the standards of a top-class hotel in the 21st century. And it’s the little details that count. False ceilings which gave the corridors an institutional feel, have been replaced with floating panels, which let in the light, but make the space feel more intimate and secure. Rejuvenating the Queens Hotel hasn’t just been all about glitter and glamour, there were some serious infrastructure issues that needed to be tackled as well. “When we took over, there were three combination boilers running the whole business. When one guest had a shower, it meant the rest of the building had to wait for three quarters of an hour for more hot water – it was always draining down the tank. “We have spent half a million pounds on a new water system, to ensure everyone can have piping hot water,” said Farid. The aim to become Southsea’s first four-star hotel remains, and work will start this year on the spa and conference rooms. “We have made a good start, and there is still more to do. “You can see and feel the potential – it really is an exciting time once again for the Queens Hotel,” said Farid.